I made this for the 4th of July when we were visiting Cedar City. It turned out so yummy I had to make it again today (plus I accidently erased the pictures, so I needed to take more). It’s kind of a combo of trifle recipes. I couldn’t find the one I wanted to make so I tried remembering the recipe, anyway it’s yummy so that’s all I care about. Tear sponge cake into bite size pieces. In a large bowl, prepare pudding according to directions. Add cool whip to pudding and mix thoroughly. Start layering trifle bowl in this order: sponge cake, pudding mixture, blueberries, sponge cake, pudding mixture, raspberries, sponge cake, pudding mixture. Garnish with remaining berries. That’s it. So easy, which is a good thing because with my family it’s gone in minutes. 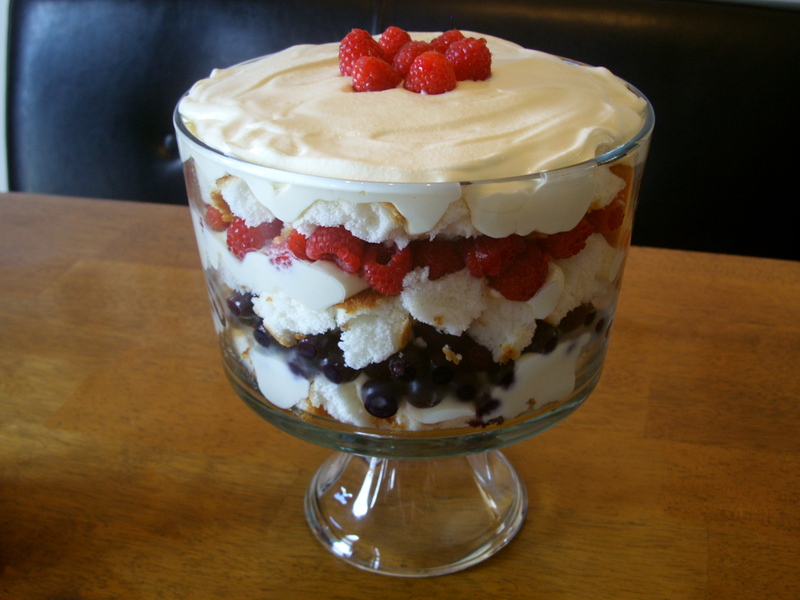 My grandmother used to make trifle for me, this bought back some great memories. Thank you. We make lots of different trifles for the same reasons. Who doesn’t love a fool proof dessert that’s stunning? 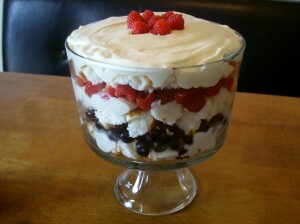 I love making trifles too, just for how simple it is and it seems that everybody loves it. I love trifles. They are easy, and look great! Looks yummy! Thanks for linking up! 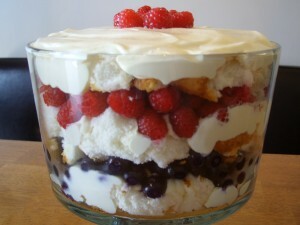 i SO need a trifle dish… that looks so yummers!! mmmmmm….delicious! I’m putting a link to this recipe in a post on crazydomestic.com on August 19th. Feel free to grab our “I was featured” button!